are you going to Scarborough? 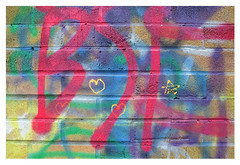 What to do on a cold day when the wind is vicious and blows right through you? It blows through my hat, my ears and my brain. It makes my head hurt. Not the ideal walking day even with all my winter layers on. 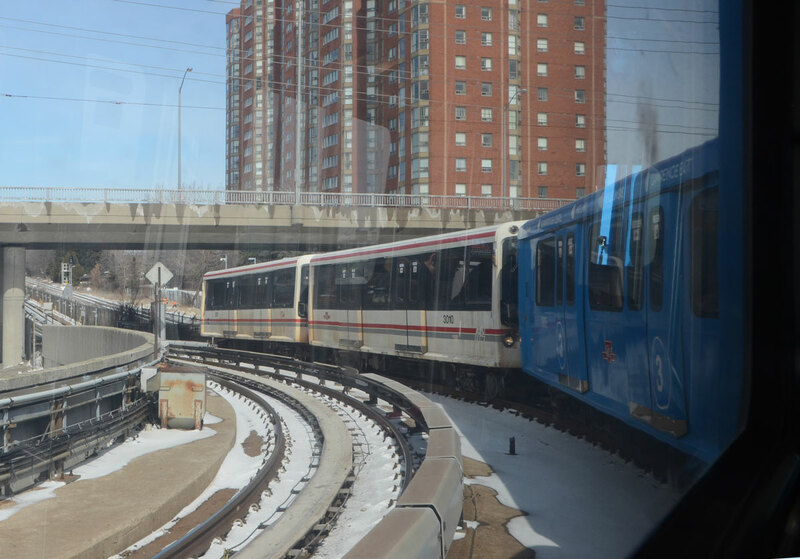 I have been thinking about my walk along Sheppard Avenue and some of the issues with public transit and while doing so I realized that I had never been on the Scarborough Rapid Transit. With all the talk about Sheppard subway vs LRT, I decided that maybe I should check it out. So instead of a walk, I went for a ride and took the SRT to McCowan and back. First I had to get to the SRT which starts at Kennedy subway station. At Kennedy I was a lost tourist as I searched for the route between the subway and the SRT. Here the SRT trains run above street level so it took a couple of escalators and some stairs to reach the platform. below: Standing on the platform and waiting for the train. Kennedy station is at Kennedy & Eglinton and I think that this is the view looking east from there. below: Leaving Kennedy station. The first part of the route is north and runs parallel to the CNR & Stouffville GO line train tracks. The red and white cars are the original colour from when the SRT opened in 1985. 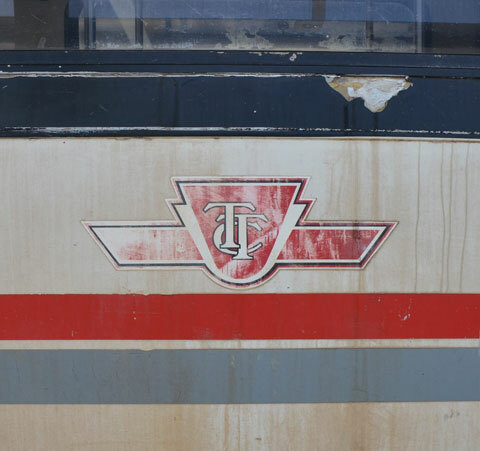 In 2015 the TTC began painting the cars blue to match the colour scheme that now goes with “Line 3” on the TTC maps. 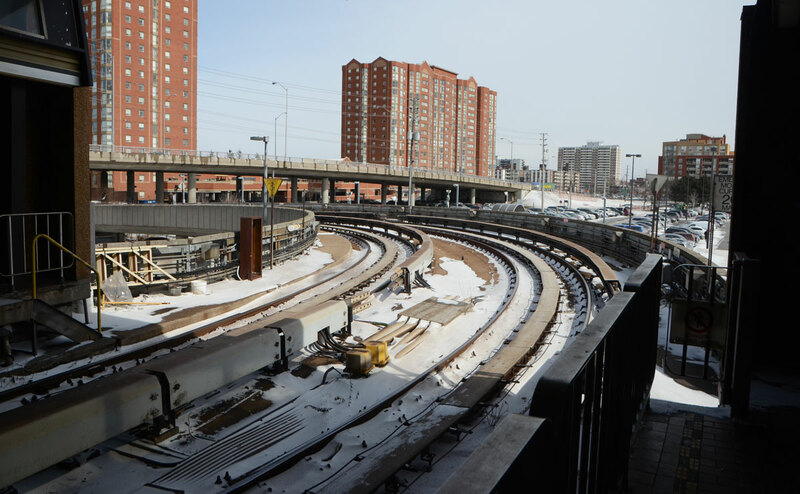 They also began two switch over the name of the SRT to Line 3 Scarborough. below: I wasn’t the only tourist on the train! 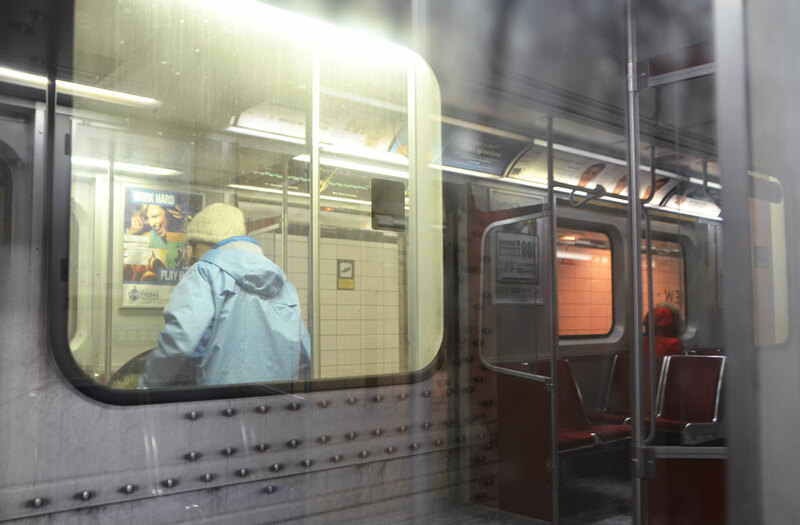 After being on the subway, it felt a bit like being on a toy train. The cars are smaller. The trains are powered by linear induction motors which are quite different from conventional motors. They push themselves along the tracks using alternating flat magnets. That’s a very simplistic description of the science of induction motors but I’m sure that you can use google to find more information if you are interested! 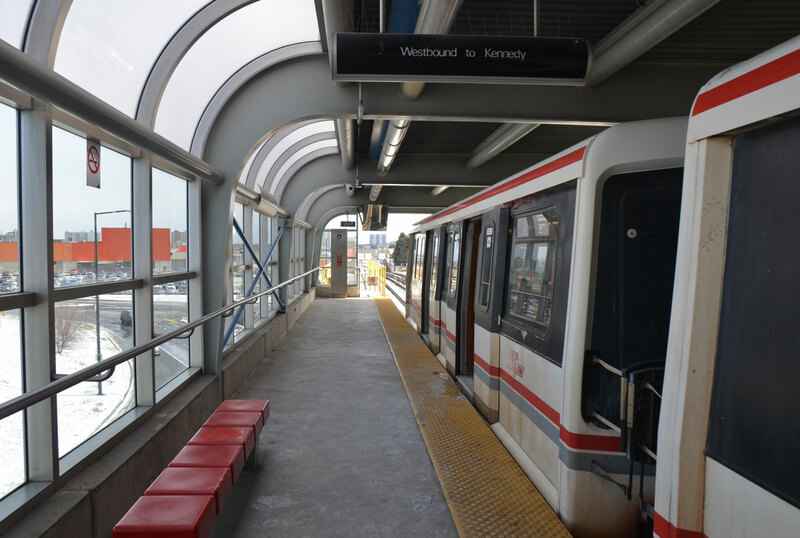 below: The Scarborough RT, also referred to as TTC line 3, covers 6.4 km on its route from Kennedy station to McCowan station. 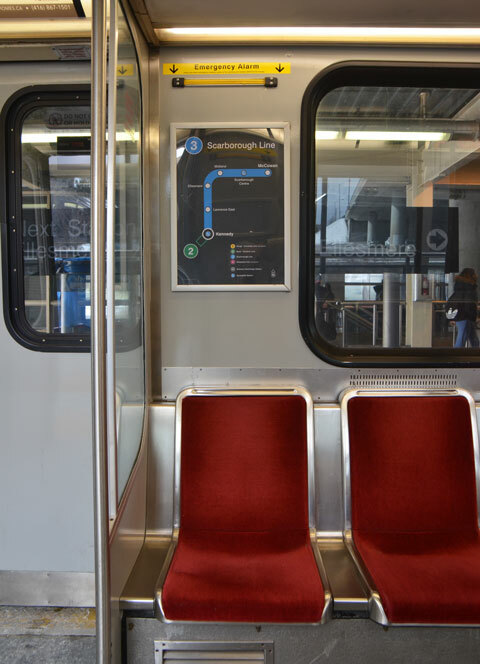 There are six stops, Kennedy, Lawrence East, Ellesmere, Midland, Scarborough Centre, and McCowan. Note the blue colour on the map! 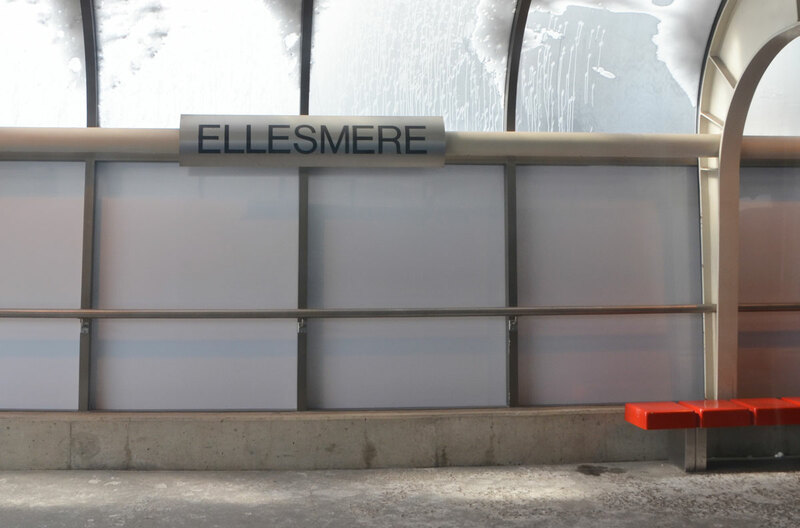 below: Ellesmere station. Apparently it is the least used station in the system, less even than Bessarion. 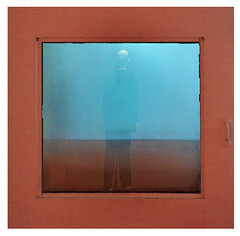 below: Looking out the back window. 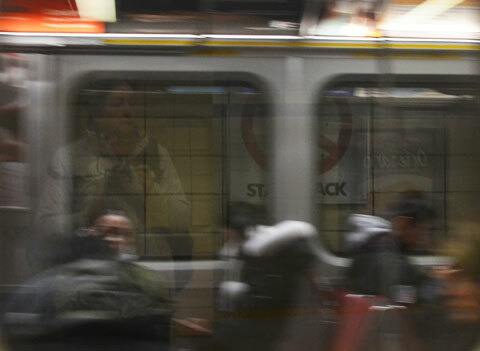 The tracks are standard gauge whereas the subway runs on tracks that are wider so the TTC can’t run their subway cars on these tracks. 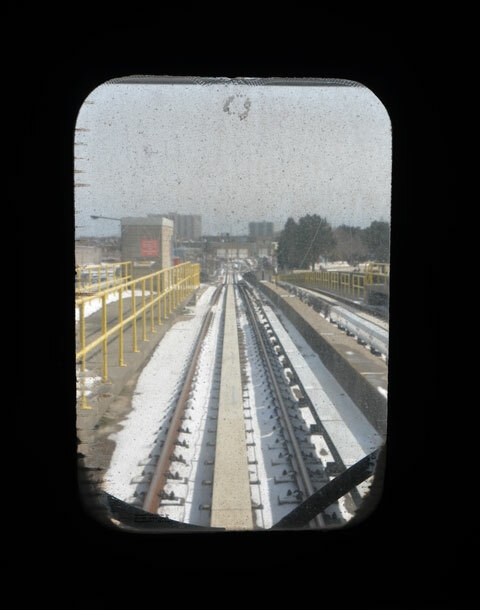 below: This is the view at McCowan station, the end of the line. 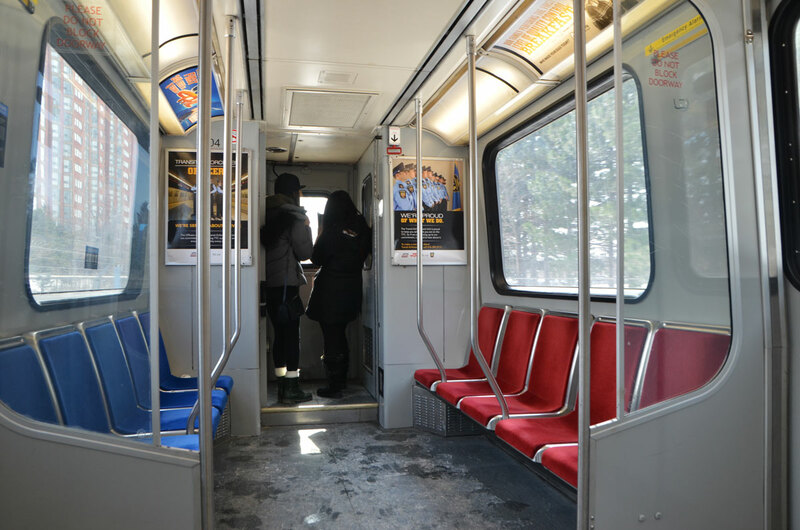 Although it was a very quiet ride to McCowan, the train was full on the ride back to Kennedy with Scarborough Centre being the most crowded station. It took 40 minutes to go from McCowan to Bloor/Yonge. 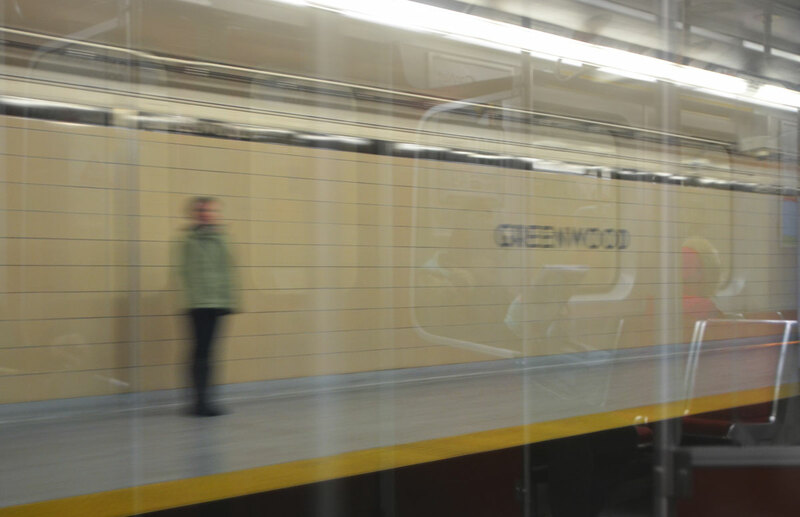 Had many a ride on the RT – the boat-like wobbling, the screeching, the odor at Midland Station, the art opposite the tracks between Ellesmere and Lawrence Station. I think you summed up the RT quite nicely! 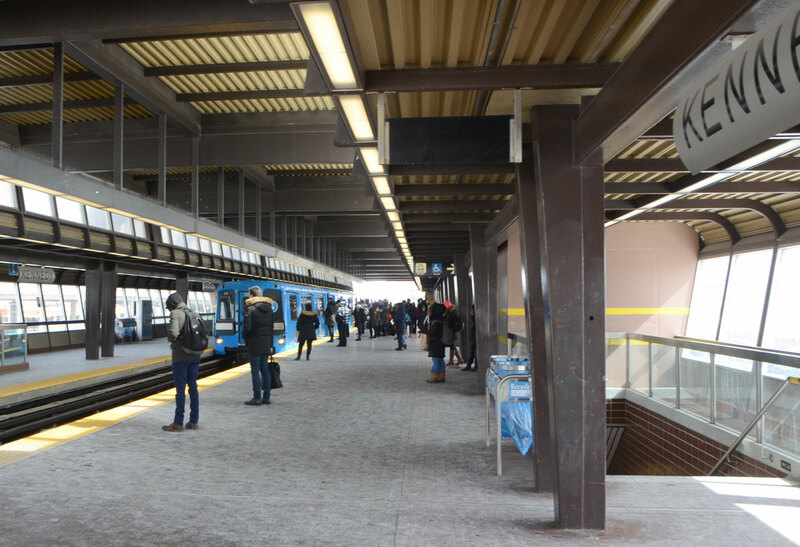 Even though the Scarborough station is very close and convenient for me, I prefer to skip the LRT completely and go directly to Kennedy station to pickup the subway. That extra transfer at Kennedy is just annoying.